February 6, 2010 - It's Super Bowl weekend — and moreover, it's Carnival season in New Orleans. There's a tradition, dating to the 19th century, of parades and parties that build to a frenzy in the weeks leading up to Mardi Gras. This Saturday, for example, the Krewes of Pontchartrain, Chocktaw, Caesar and Sparta are scheduled to fill the streets with music and color. 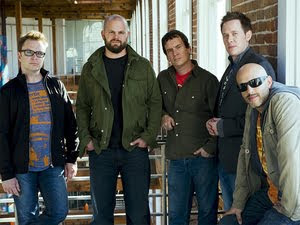 Just in time for the season, the New Orleans band Galactic is releasing a new album, called YA-KA-MAY. The title refers to a regional noodle dish whose pronunciation varies throughout the city — which producer and horn player Ben Ellman says acts as a metaphor for the multifaceted nature of Galactic's music. "It sort of represented something we were looking for from the record," Ellman says. "Something that represents the city, as a whole — you know, all different sides of it, you know. So it really was inspired from this, what's essentially a hangover cure in corner stores. And it's really just sorta, like, Top Ramen with spaghetti." Ellman and drummer Stanton Moore spoke with host Audie Cornish about the record, which features a variety of guest artists from New Orleans. Moore says YA-KA-MAY reflects the outlook of a younger generation of NOLA musicians, from new-school horn players to the regional dialect of hip-hop called Bounce music. "So really, this record is designed almost to be a night out on the town of seeing music with Galactic, as being hosted by us," Moore says. "So it's almost as if we're bringing you along — 'Hey, come check this out; hey, come check this out.' And you can have anything from ... contemporary jazz, traditional jazz, lots of different funk and brass bands, even Afro-Cuban, reggae ... avant-garde stuff going on. All kinds of different music. So we all kind of grew up with that."